I wasn’t ready for how powerfully written this book is! Why didn’t anyone tell me about Joe Abercrombie sooner? 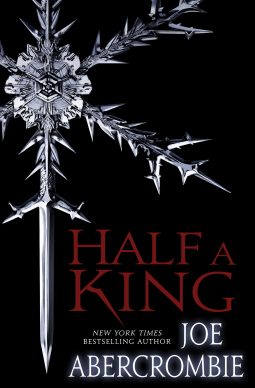 Half a King has created characters and a world that could and should become legendary! A coming of age story of a young and reluctant would-be king, Half a King follows the journey of one young man, whose deformity makes him the object of tauntingly, cruel laughter and the ugliness of those who cannot accept someone who is different. After his father’s death, there is only Yarvi to take the throne, but he is a scholar, not a warrior and the realm needs a strong hand to guide it that the people can trust and believe in. When treachery and betrayal threaten to end Yarvi’s life, he flees, beginning a journey of danger, death and self-discovery that will forever change him from a frightened young boy to a brave young warrior and leader who learns to out think his opponents when he cannot out maneuver them hand to hand. He has made a vow and is determined to keep it, no matter the risk. If Yarvi and his unusual band of allies can survive the long and painful journey, what will he discover when he arrives home? What will he do, with just a few allies to stand with him against the power of the ruling king? Although Joe Abercrombie’s target audience is Young Adult readers, this is one fantasy that will be enjoyed by all ages. Each scene comes to life in brutal clarity while each character becomes a living, breathing person in their own right>? Are there plot twists? Definitely. Did the characters grow before my very eyes? Yes. Are there hidden pearls that make the journey that much better? Certainly. Will heroes rise as I’m cheering for them? Oh, yes. Did I feel like crying when allies fall to their deaths? Yes. Get ready to be swept into an incredible tale of bravery, stamina and determination, rich in detail, emotion and creativity that feels real. I received an ARC edition from Random House Publishing Group - Del Rey Spectra in exchange for my honest review.